and Marie of Algodao Tao Doce. Please visit these ladies, and be prepared to be impressed. This is the second card I taught this month, and it is modeled on a 'make and take' card that I made at a Stamp Expo earlier this year, with a panel of acetate in the centre of the front, and the sentiment stamped behind it. The tree is one from an older set from Unity Stamps that I gold embossed, then mounted over a red layer. The paper on the top and bottom was randomly stamped with a group of notes from various (clear) stamp sets clustered together on an acrylic block. I do not know where the sentiment comes from, but I have had it for years and love using it. The embossing looks messy in this picture, but it is not - I think there were marks on the acetate that the camera picked up. When making this card with the Christmas 'feel' to it, I was thinking of friends who have lost a loved one about this time of year, and may not actually be feeling very festive, so it does double duty, as it were. There is something about gold embossing that really elevates a card. Love the panel with the see through element too. Thanks so much for joining us in our ATG's week at Brown Sugar Challenges. Hope you'll join again soon. Take care. Very pretty design. I love the gold embossing....so pretty! Thanks for joining us at Just Us Girls! Love this golden tree on the vellum. Looks so pretty with the vellum & red mat against that nice patterned stamping as well. Great design, and how thoughtful of you to be thinking of those who may not have quite as happy a holiday this year while missing a loved one. This is a card that will be especially appropriate in that situation. TFS & Hugs. I love this layout, Maxine! And that golden tree is gorgoeous! Darling card! Fantastic embossing! Thank you for playing along in the Word Art Wednesday Challenge! Have a blessed day! Maxine thank you so much for welcoming me to your blog! I love your card! such a great idea! very inspiring and I will definitely try it! Have a great week! Such a cool design, Maxine! Love that tree! OH my goodness Maxine, this is absolutely lovely. I love the fun fold you have created here! Great card and design Maxine! what a great card Maxine. I bet your group enjoyed learning this one. Love your gold tree it's so unique and different! Well done! 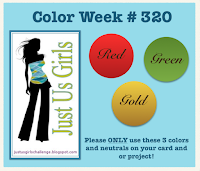 Thanks for playing along with us over at Just Us Girls this week!